MSU is named after Mikhail Lomonosov. He was an amazing self-made man. Born in a village near Archangelsk (North of Russia), he was so keen to study that he took what he could learn in his village and then left home and moved first to Moscow and St. Petersburg and later to Germany. 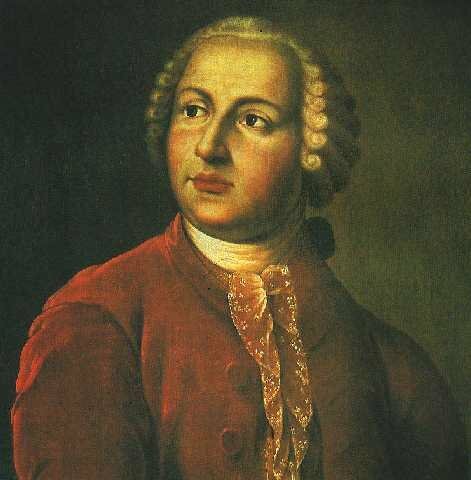 Lomonosov became a professor of Chemistry when he was 34. 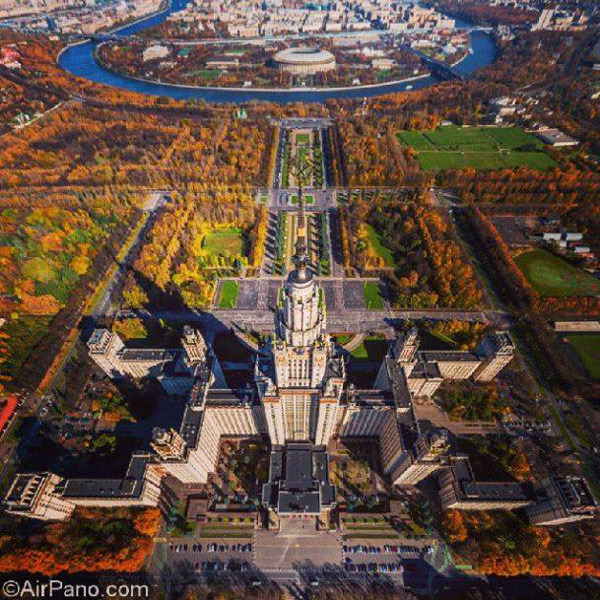 Founding of Moscow State University was done under his influence and according to his project. Now MSU has 15 Scientific Institutes and 40 Schools. In total there are about 50 thousand students (35 thousand undergrads, 5 thousand PhDs (and other graduate majors) and 10 thousand students from prep departments. There are about 4 thousand professors and 5 thousand of researchers. 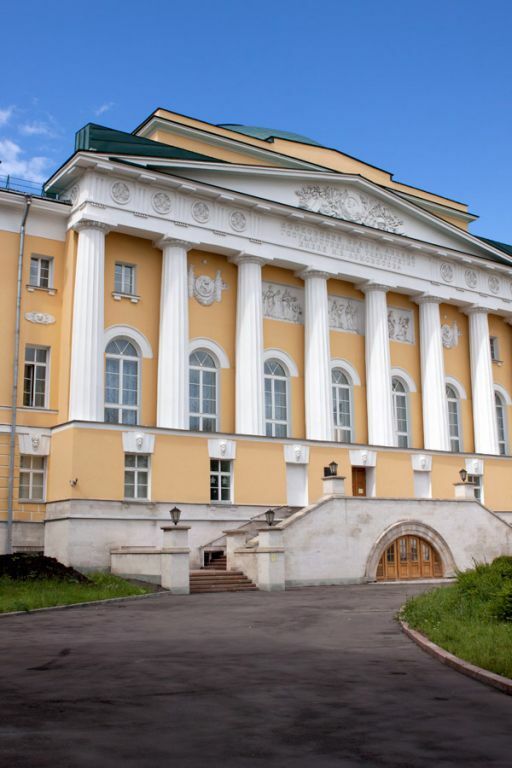 There are actually two campuses – the old one, located near Kremlin and the new one (opened in 1954). 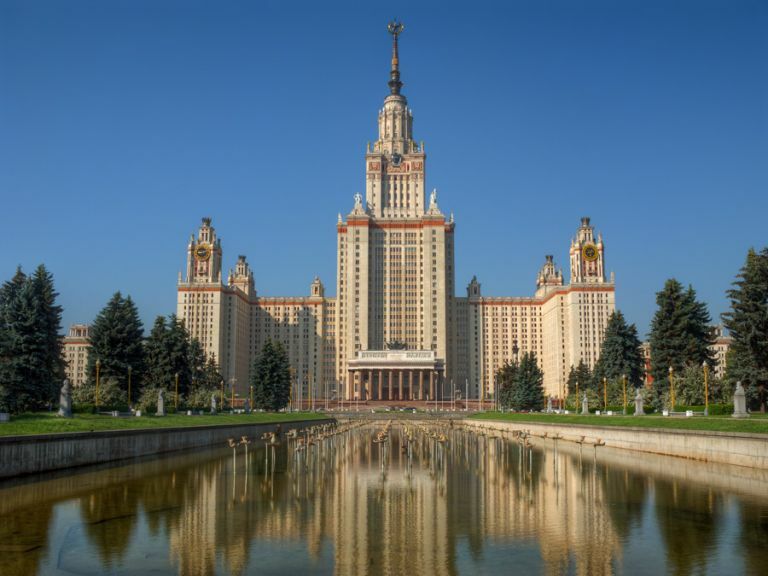 For me, University associates with the new campus and, in particular, with the gorgeous Stalin high-rise, the main building of the campus. Campus territory is huge. Main building is the most interesting because in addition to hosting several Schools (Math, Geography, Geology, Medical School), it is a small city in itself. Students, who study in one of those schools and who live in dorms in the same building, do not need to go out of the building. It has libraries, canteens, hairstyling salons and even a museum of minerals. Other Schools – Biology, Chemistry, Physics, Economics, etc have their own buildings, but the Main Building has always been the biggest magnet and the center of attraction. This building was build by prisoners – in Stalin times it was a typical practice. There is a sad legend, which may be true, that one of the prisoners decided to escape, like Ikar, but plywood wings did not hold him well enough and he died. There are also plenty of others, happier legends. We, students, really believed in them! Legends about the Main Building say that the building is too high for Moscow soil, therefore there is a huge freezing equipment, located in the basement, which helps to hold the thing in place. There are also many rumors about ghosts in the basement of the building and guys always used these rumors to scare girls. Massive revolving doors at the entrance were always very heavy, you have to push them. People said that they are so heavy for a reason, that they are connected to power generators. Thousands of students, who go through these doors every day, help to produce electricity, which enables elevators. All elevators are equipped with phones, but from one of the phones you can call any country in the world free of charge. Finally, there are many conspiracy theories about Moscow Subway system and one of them says that there is a secret subway line going from Kremlin to the University and, if you are attentive, you can see it from one of the stations. I totally believe that the secret subway exists, but I think the line goes from the University to the outskirts of Moscow rather than to Kremlin (it makes much more sense – in case of emergency you may want to evacuate the best minds of the country). Other buildings of the campus also have thematic legends. There might be a super-intelligent dolphin, living in the basement of Biology School. And Chemistry School certainly has an alcohol pipe, hidden among the water pipes at the labs. Students and alums love the alma mater and have great nostalgic feelings about it! One thing I remember well from the University are the very slow and crowded elevators, but that was 25 years ago. One of the nicest walks I ever took was through the campus with the softly falling snow, just beautiful! Dear Chiristine! I think that not much has changed since that time – elevators are still old and slow. What delighted me 15-20 years ago was that there was a phone in the elevator, which students could use to call long distance. I have not been there for some time, so not sure it still works, hope it does. What I love about my University – it is a building with so much history and legacy. I do enjoy visiting even if the elevators are slow and not very modern. It brings good memories! What did you study when you were here? Which department? Do you still have friends you are in touch with? Have you been back to Moscow recently? Have you seen much changes? Were those changes positive or negative?